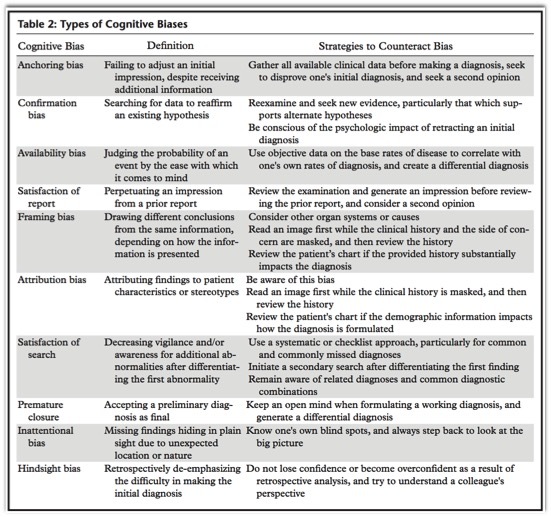 Bias in Radiology: The How and Why of Misses and Misinterpretations Busby LP et al. • Quality Assurance and Peer Review. Waite S, Scott JM, Legasto A et al. Interpretive Error in Radiology Waite S et al. nterpretive Error in Radiology Waite S et al. - Collision tumors that have been defined as representing 2 pathologically distinct lesions (such as a benign and a malignant lesion), giving the appearance of a single lesion. The benign features of portions of a conglomerate lesion (ie, intralesional lipid) could lead to the false conclusion that the entire mass is benign. - Metastases to the adrenal from renal cell carcinoma or hepatoma can be confused with pheochromocytoma or even adenoma based on washout values. - Macroscopic fat in an adrenal mass is effectively diagnostic of adrenal myelolipoma; however, smaller amounts of fat can be present within myelolipomatous metaplasia of adrenal cortical neoplasms such as degenerated adenomas and adrenal cortical carcinomas.
" Human error is inevitable. " 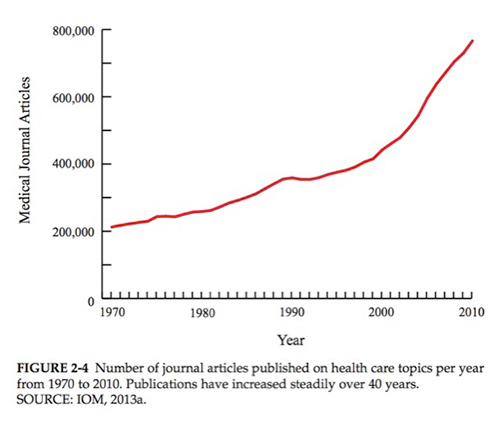 "We calculated a mean rate of death from medical error of 251 454 a year using the studies reported since the 1999 IOM report and extrapolating to the total number of US hospital admissions in 2013. We believe this understates the true incidence of death due to medical error because the studies cited rely on errors extractable in documented health records and include only inpatient deaths. Although the assumptions made in extrapolating study data to the broader US population may limit the accuracy of our figure, the absence of national data highlights the need for systematic measurement of the problem. 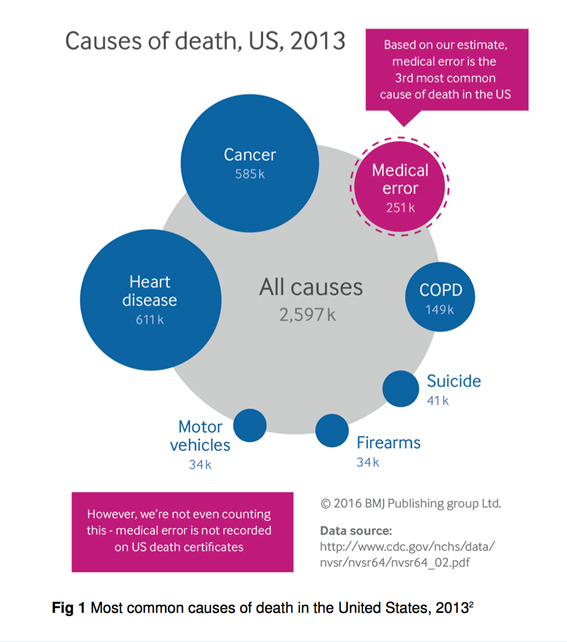 Comparing our estimate to CDC rankings suggests that medical error is the third most common cause of death in the US." "Comparing our estimate to CDC rankings suggests that medical error is the third most common cause of death in the US." "Human error is inevitable. Although we cannot eliminate human error, we can better measure the problem to design safer systems mitigating its frequency, visibility, and consequences. Strategies to reduce death from medical care should include three steps: making errors more visible when they occur so their effects can be intercepted; having remedies at hand to rescue patients; and making errors less frequent by following principles that take human limitations into account." 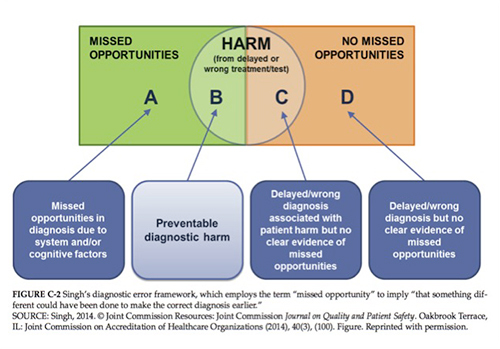 "Medical error has been defined as an unintended act (either of omission or commission) or one that does not achieve its intended outcome, the failure of a planned action to be completed as intended (an error of execution), the use of a wrong plan to achieve an aim (an error of planning), or a deviation from the process of care that may or may not cause harm to the patient." 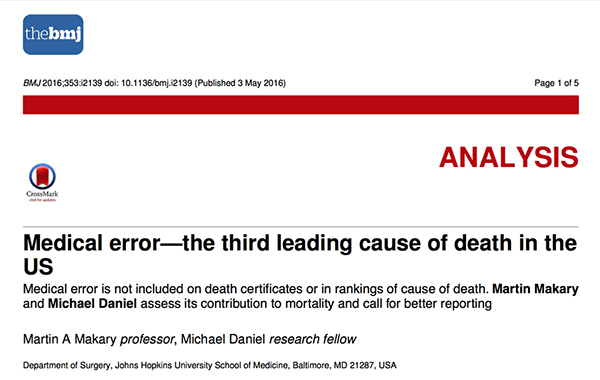 "Currently, deaths caused by errors are unmeasured and discussions about prevention occur in limited and confidential forums, such as a hospital's internal root cause analysis committee or a department's morbidity and mortality conference. These forums review only a fraction of detected adverse events and the lessons learnt are not disseminated beyond the institution or department." • A conservative estimate found that 5 percent of U.S. adults who seek outpatient care each year experience a diagnostic error. • Postmortem examination research spanning decades has shown that diagnostic errors contribute to approximately 10 percent of patient deaths. 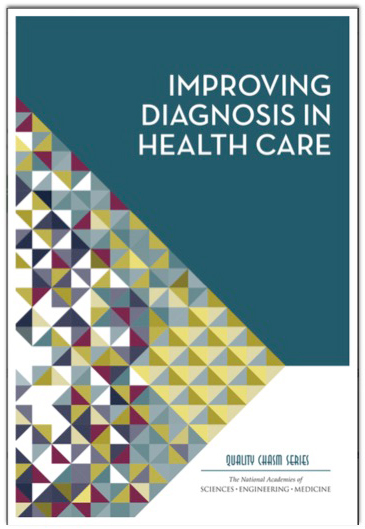 • Medical record reviews suggest that diagnostic errors account for 6 to 17 percent of hospital adverse events. 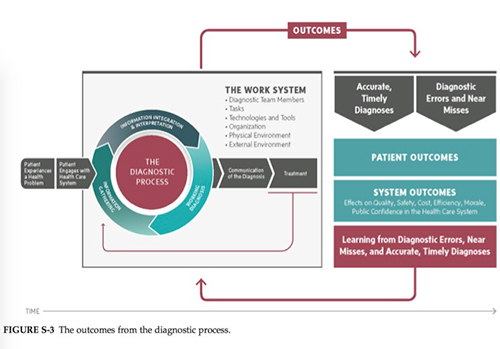 • Diagnostic errors are the leading type of paid medical malpractice claims, are almost twice as likely to have resulted in the patient’s death compared to other claims, and represent the highest proportion of total payments. 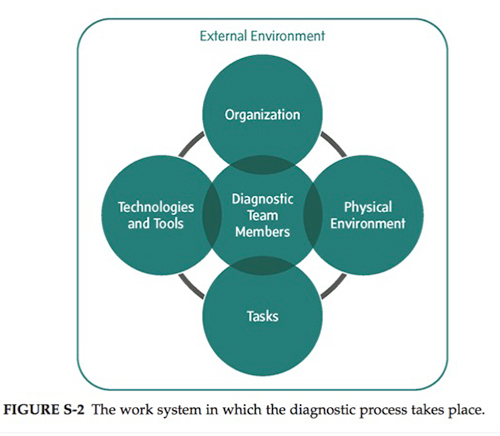 • Intra- and interprofessional teamwork in the diagnostic process. 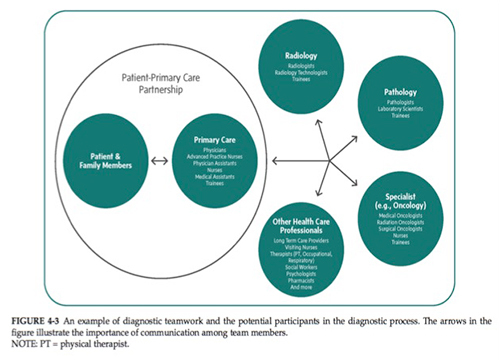 • Collaboration among pathologists, radiologists, other diagnosticians, and treating health care professionals to improve diagnostic testing processes. 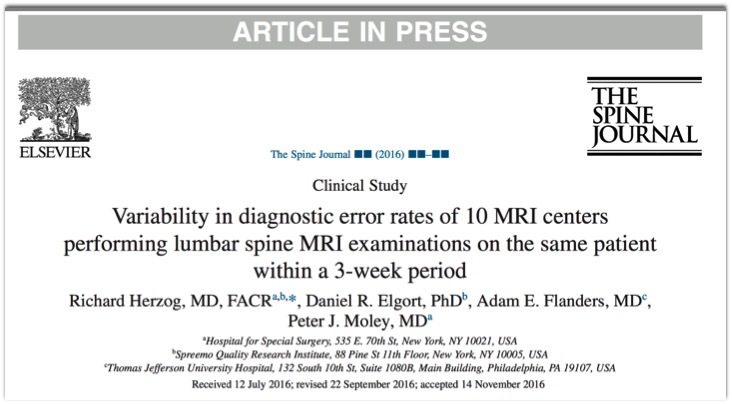 The Effect of Faster Reporting Speed for Imaging Studies on the Number of Misses and Interpretation Errors: A Pilot Study. J Am Coll Radiol. 2015 Jul;12(7):683-8. doi: 10.1016/j.jacr. 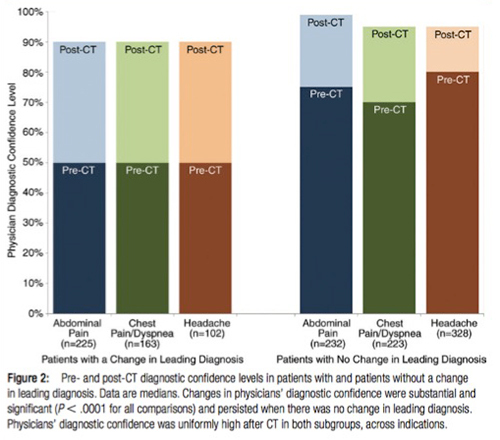 CT in the Emergency Department: A Real-Time Study of Changes in Physician Decision Making Pandharipande PV et al. What are the typical missed diagnosis seen in MDPC? Srinivasa Babu A, Brooks ML.